Professor Werner von Brawn is a professional wrestler with World Class Wrestling. He is billed as being from the University of Heidelberg and he taunts the audience by kissing his muscles. 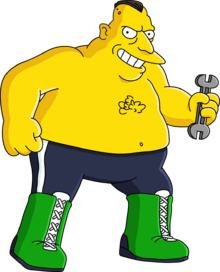 He had a much-anticipated "wrestling match of the century" with Rasputin the Friendly Russian at the Springfield Center for the Performing Arts. Rasputin took control in the match early on, but lost after being hit over the head with a wrench by von Brawn. Professor von Brawn's name is a pun on rocket scientist Wernher von Braun. Modified on May 19, 2013, at 00:40.